From Monday, 22 May to Tuesday, 6, June, there will be changes to the entry and exit for car park P3 as we complete works for the Westmead Redevelopment. 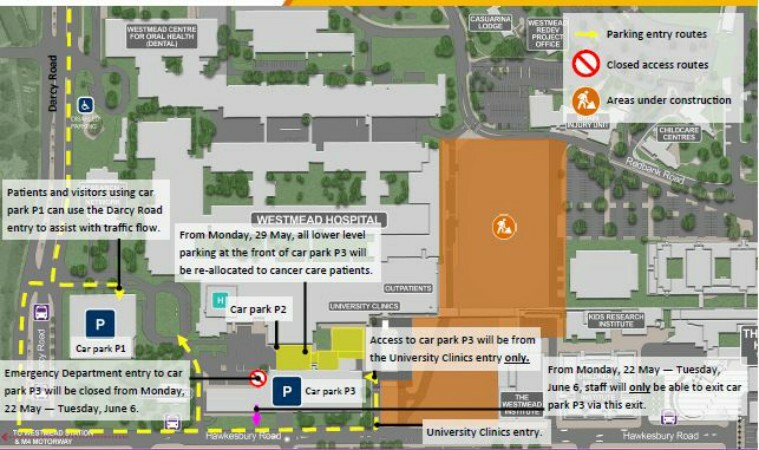 From Monday, 22 May to Tuesday, 6 June, the entry & exit for car park P3 (near the emergency department) will be closed. (see above map). From Monday 22 May to Tuesday, 6 June, the only exit from car park P3 will be via the rooftop exit (see map). Access to car park P1 (near the main entrance) will be unaffected. Patients and visitors should use the Darcy Road entry to access the car park. Traffic control and signage will be in place to assist.